Whatever your means of travel are, on foot, bike, scooter or magic carpet, you can get to us from all directions in Wynyard Quarter. If you’re visiting us during business hours you can enter the John Lysaght building from two places, 101 Pakenham St West or through the laneway off Halsey St. The main entrance for 12 Madden Street is half way down Madden Street, Wynyard Quarter. 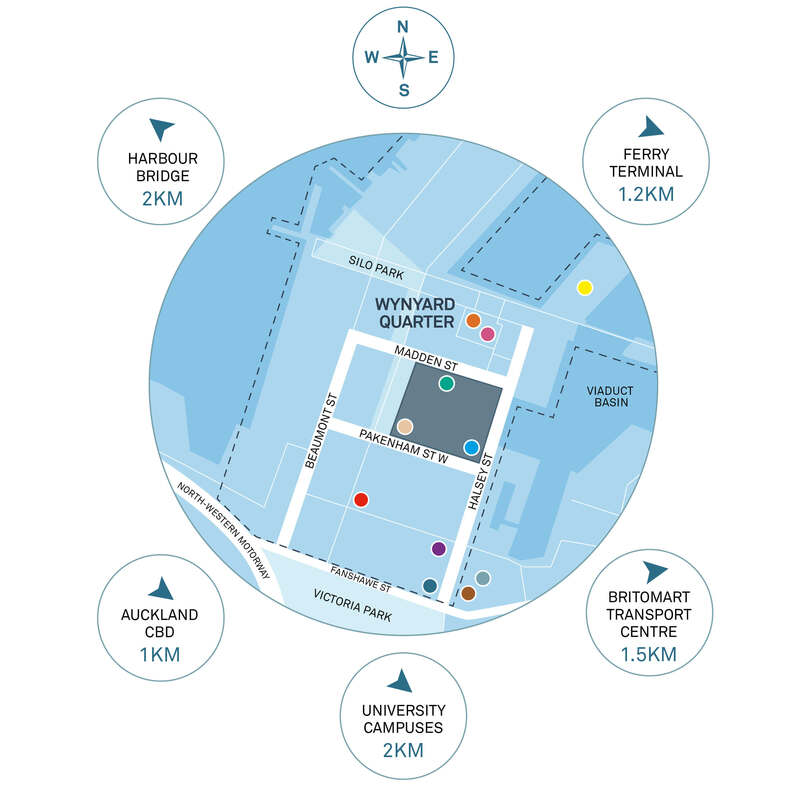 Keep in mind that Wynyard Quarter operates on a 70/30 split, with 70% of people expected to visit the area by public transport, on foot, bike, scooter, skateboard, interpretive dance, or hover board! And the rest in their car. If you can hop on a bus, or jump in a taxi to visit us, do consider this! Your event will be in either the Event Space or the Tech Cafe at the John Lysaght Building, 101 Pakenham St, or the various spaces at 12 Madden St. The John Lysaght event space can be found by turning left as you come through the doors at 101 Pakenham Street West on the ground floor, or entering from the laneway directly into the event space. Look for signs directing you to your event and please be mindful if there is another event in progress. If you found it tricky to find the event you were after, please let the event organiser know so we can make this process easier next time. The concierge inside the main foyer of 12 Madden Street will help you find your way to the different event venues within the building. If you are looking for any of the companies based out of the John Lysaght building, head up the stairs to the left of the cafe to our level 1 coworking space. One of our lovely team will point you in the right direction! For Generator residents at 12 Madden St or Mason Bros, please enquire at the concierge desk on arrival and we will help you find your way. We have noted the awesome amount of bike enthusiasts around and this is a movement that we want to support as much as we can. With that in mind we have made sure that both Lysaght and Madden St have large bike storage areas, with over 20 racks. The buildings also have excellent shower and bathroom facilities on site. We encourage you to use public transport! The City Link bus includes a circuit of Daldy and Beaumont streets every 8 minutes from Monday to Saturday and connects to services across the region. The #10 Bus service provides an hourly weekday service between Onehunga and Wynyard Quarter via Pt Chevalier, with a 30 minute frequency during peak times. The Inner Link and Outer Link buses stop on the other side of Victoria Park, only a short walk away. Similarly, the North Shore buses stop on Fanshawe Street, just minutes from GridAKL. Have you thought about purchasing a scooter? The Council offers free designated parking for motorbikes and scooters in all its car parking buildings. The council also tends to have a relaxed approach to parking motorbikes and scooters in laneways and on footpaths as long as they are out of the movement of pedestrians.